Look for this seal to ensure your agent is a trusted member of Independent Insurance Agents for a Cure. When you support a local participating Independent Insurance Agent with your business you make it possible for Independent Insurance Agents for a Cure to continue its fight against Breast Cancer. 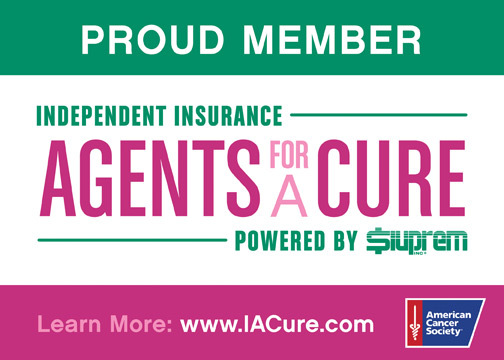 Independent Insurance Agents for a Cure is a recognized partner of the American Cancer Society and a community driven effort by SIUPREM Premium Finance. IACURE Featured in Altanta Magazine! The IACURE Campaign to Fight Breast Cancer was part of a special featured section in Atlanta Magazine – click below to download and view the article. THE *SIUPREM CARES FOUNDATION* is a 501c non-profit, charitable organization affiliated with SIUPREM, Inc. Through the support of business from SIUPREM’s Independent Insurance Agent Partners, voluntary donations and special events proceeds, the SIUPREM CARES FOUNDATION supports Breast Cancer Awareness and Research programs as provided through the American Cancer Society.